I’m a sucker for quotes y’all. If you read a lot of my articles, particularly some of the more personal ones then you will know that I quote things all the time. 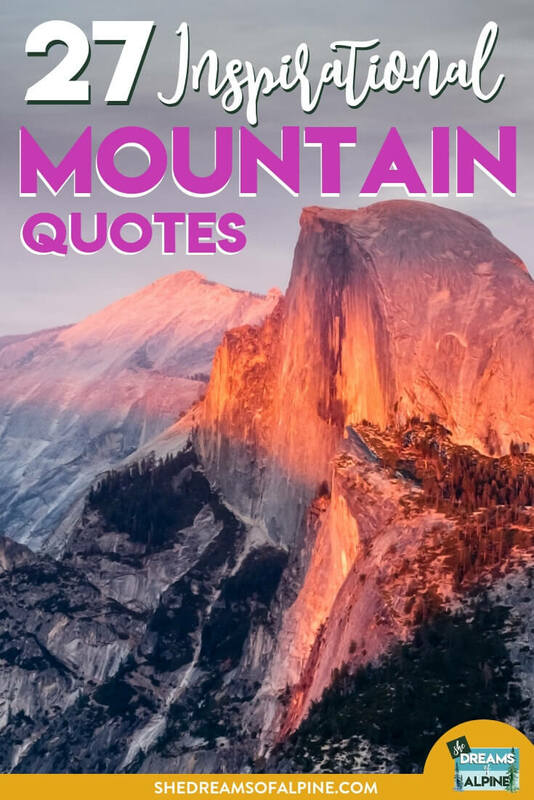 So I’ve decided to compile 27 of my favorite inspirational mountain quotes of all time into this post. The best part is… I want to add to this list! If you have a favorite quote and I don’t have it listed here, tell me about it in the comments! Seriously though… I need more mountain quotes in my life! I’m sure I will also add more… the more stories I read and books I consume. This is going to be awesome! And next time you need a pick me up, or you are feeling not-so-inspired by life, you can come back to this post and be reminded that we all struggle, and part of life’s big journey is pushing past the challenges that face us. So here we go… my favorite inspirational mountain quotes! Some of the quotes below have a story to go along with them, some of them I read in books, some I heard in talks and some I can’t remember where I heard them, but have them written in my notebook of quotes (yes, I keep a notebook of quotes). I hope you find that one of them touches you as some of them have done for me. A Story: I have this tattoo on my arm that came from this first inspirational mountain quote above. It was early in my adventure story (I haven’t posted my “story”) yet, but it’s coming soon. I had just completed my first year learning about mountaineering with a Climbing Club in Utah I had joined. We had done 2 or 3 trips that year, one of them being Mount Whitney’s Mountaineers Route. I was so inspired by the mountains and the joy they had brought my life but saw this beautiful parallel between mountains and life in general. Mountains aren’t just beautiful. They are insane struggle, challenge, and sometimes disappointment as well. I read this quote somewhere one night, and I felt it in my core. My life had been this series of achievements, disappointments, struggle, and joy… it was the say feelings I got when I went out into the wilderness. So I got a tattoo inspired from this quote, it says, “On life and mountains, it is the same”. I feel like I wouldn’t get away with writing a post about inspirational mountain quotes without dropping the most well known one, and while sometimes its easy to feel like it is overused… I can’t say that I don’t feel this way every time the weekend rolls around. John Muir captured a strong feeling with that short sentence. “Those at the top of the mountain didn't fall there." I love the simplicity of this, but just goes to remind you. Its easy to look at everyone’s success stories and think it’s all rainbows and unicorns. However, they struggled and had challenges, just like you and me. There are no unicorns. I have no idea who said this quote, but I love it! It’s so true. I grew up very religious as a child. I don’t really go to church anymore, but I sort of see nature and the outdoors as my new church. It’s where I go to find community (with other climbers and hikers) and it’s where I find my peace.. the deep inner peace. It’s also where I go to confront my greatest challenges, learn humility, and be in awe of beauty. For more inspiring quotes, check out this post on inspirational quotes about travel! Well, I really hope you liked this list, and like I mentioned above… Leave me any of your favorite ones in the comments below! I’ll be going back and updating this post throughout the year to add in new ones! Before we part, I’ll leave you with two final quotes that I LOVE. If I’m being honest, those two quotes are really what this blog is all about. It’s one thing to dream of beautiful mountains, hiking beautiful places, and traveling all around the world. It’s another thing to LIVE those dreams. Let your curiosity and your dreams drive your life… not your fears. Looking for more Quotes posts? Check out my 57 Quotes to Inspire Your Solo Travels.